Accordion Centre Birmingham - specialists in all things accordion! 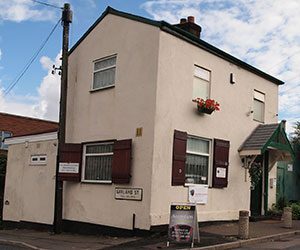 The Accordion Centre, as it is today, was established over 30 years ago and is headed by Robert Beecroft. Rob, is a fully trained engineer, accordion tuner, specialist repairer and of course, accordionist! The Accordion Centre is well known for the repair and tuning services offered from our factory workshop. Passionate about sourcing and supplying some of the finest Accordions, Melodeons and Concertinas from Italy and Europe, Rob offers instruments from Serenellini, Victoria, Brandoni, Hohner, Sonola, Excelsior, Weltmeister, Boorinwood to name but a few. Please see our stock list under our products for current stocks of these and many other well known quality brands. 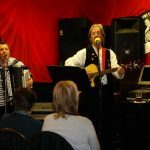 The Accordion Centre is run by accordionists for accordionists and melodeon and concertina players! Our goal is to bring you great quality instruments and accessories at affordable prices with a guarantee on all of our stock. Whether you are browsing, buying, or seeking help and advice, a warm welcome always awaits you at the Accordion Centre, renowned for its friendly atmosphere and unique character. Take a look at our Facebook page for up-to-the minute news on what we’re getting up to! 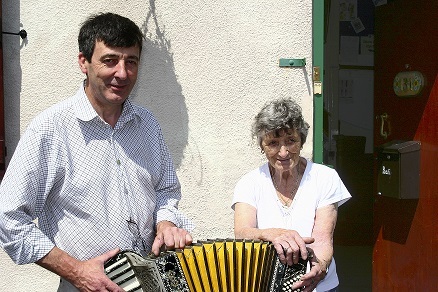 Rob with his mother Gladys outside the Accordion Centre.